We’d love your help. Let us know what’s wrong with this preview of Friendships Don't Just Happen! by Shasta Nelson. This essential go-to guide reveals how women can enhance their lives by creating valuable friendships in today’s busy, mobile world, from nationally recognized friendship expert and CEO of GirlFriendCircles.com. Every woman is searching for a happier, healthier, more fulfilling life. Many realize the significant role that an intimate, tightly knit circle of friends plays i This essential go-to guide reveals how women can enhance their lives by creating valuable friendships in today’s busy, mobile world, from nationally recognized friendship expert and CEO of GirlFriendCircles.com. Every woman is searching for a happier, healthier, more fulfilling life. Many realize the significant role that an intimate, tightly knit circle of friends plays in creating a more fulfilling life, but with hectic schedules, frequent moves, and life changes, it’s more important than ever for women to establish natural, meaningful friendships that will contribute to their overall wellbeing. In Friendships Don’t Just Happen!, Shasta Nelson, friendship expert and CEO of GirlFriendCircles.com, reveals the most important proven steps, processes, and secrets vital to establishing the five different levels of friendships, or Circles of Connectedness, that women—no matter their age or relationship status—are longing for in today’s stressful and mobile culture. This revolutionary, engaging guide will also benefit women who already feel rooted to fabulous friends, with insightful principles that will help them maintain and enhance their current friendships. There is a lie out there that real friendship just happens. When I was new to San Francisco eight years ago, I remember standing at a café window on Polk Street watching a group of women inside, huddled around a table laughing. Like the puppy dog at the pound, I looked through the glass, wishing someone would pick me to be theirs. I had a phone full of far-flung friends’ phone numbers, but I didn’t yet know anyone I could just sit and laugh with in a café. It hit me how very hard the friendship process is. I’m an outgoing, socially comfortable woman with a long line of good friendships behind me. And yet I stood there feeling very lonely. And insecure. And exhausted at just the idea of how far I was from that reality. I knew I couldn’t just walk in there and introduce myself to them. “Hi! You look like fun women, can I join you?” I would have been met with stares of pity. No one wants to seem desperate, even if we are. We don’t have platonic pick-up lines memorized. Flirting for friends seems creepy. Asking for her phone number like we’re going to call her up for a Saturday night date is just plain weird. All the batting of my eyelashes wasn’t going to send the right signals. And so I turned away from the scene of laughter and walked away. No, unfortunately, friendships don’t just happen. Friendships may not happen automatically, but what we crave about them sure seems to! We all want to belong—that need to be connected to others is an inherent desire. We live our entire lives trying to fit in, be known, attract acceptance, and experience intimacy. We desperately want to have others care about us. This book is about that hunger. And more pointedly, it is about listening to it and learning how to fulfill it. To ask other readers questions about Friendships Don't Just Happen!, please sign up. Be the first to ask a question about Friendships Don't Just Happen! While a great reference chock full of easy to understand principles highlighted with stories and examples, it certainly hasn't made this journey any less awkward. I like that she comes right out and says that we have all of these resources in place for dating - finding dates, putting out a framework of who you are looking for, etc....but why is making friends as a grown up so tough? And, to be completely honest, some of her suggestions are straight up ridiculous - have an "I appreciate you" part While a great reference chock full of easy to understand principles highlighted with stories and examples, it certainly hasn't made this journey any less awkward. I like that she comes right out and says that we have all of these resources in place for dating - finding dates, putting out a framework of who you are looking for, etc....but why is making friends as a grown up so tough? And, to be completely honest, some of her suggestions are straight up ridiculous - have an "I appreciate you" party, where you sit around and look all these new acquaintances in the eye and say "I appreciate you"...?? No. That's just weird, and insincere, and...well...AWKWARD. C'mon now. Just no. I've always had very strong bonds with my besties, but they've scattered across the map. Some have just moved to different phases- the friends with multiple kiddos have more time for play dates than friend dates, if they have time at all. I did my crazy traveling and living elsewhere when I was younger. I've lived abroad, I've spent time in communal living communities in Europe, the UK, and the US. Now that I have so many things tying me to this place where I live, it's time to accept that I almost need to start over - living in a college town as a non-college student is an interesting (and kind of intimidating) proposition. And working with university students, mainly undergrads, has made me feel old and wizened, and tired...I think I'm young, 'til I come to work and spend all day talking to 20 year olds. But in a deep and personal way....I seek friends who are growing in the same direction as I am. Friends who want deep, meaningful relationships. Who want to talk about the tough stuff, who want to challenge and be challenged...I feel that Shasta laid a decent framework for how to build up to that in this book, practical advice about how the more people you meet, the more likely you are to find someone who you really connect with (makes sense right? But sounds exhausting! )...but that niggling thought still rankles-shouldn't this just happen? And is the very act of reading about this topic a little awkward? How was it so much easier earlier in life? You know, I never ever ever thought something so basic, so necessary for the human psyche, could be so challenging to cultivate. This review is a work in progress. And I am clearly feeling a little hostile, so feel free to take it with a grain of salt. -We like people who like us: "Sometimes our insecurities get the best of us and we erroneously think we need others to be wowed by us. On the contrary, most people aren't drawn to people they are intimidated by as much as they are drawn to people who seem to care about them." .... "Neuroscience describes a secret that helps make the caring interaction easier for us. Our brains are filled with mirror neurons, which essentially ensure that what we give is the same as what we receive. It's why we yawn when we see someone else yawning, and why we're more likely to get a smile back when we smile at them, and why they're going to like us more when we tell them we like them." -About not getting stats, but the stories behind the stats: "Do we really care what school she went to or where she grew up or how many siblings she had? .... What brings us together are stories about why she chose that school, what she loved and hated about her hometown and her favorite memories with her sisters when they were growing up." I read the Kindle edition of this book and I was highlighting constantly! It is packed full of friendship wisdom and insight. I wish I had this information when I was younger! It's wonderful to finally know what a friendship is and what it isn't. Now I can't wait to start making some good friends! I have to say, I was really looking forward to this book, and I was a little disappointed with it. The first half had some good information in it, but it seemed like everything was either 1.) Available on the blog, which means I've already read it, or 2.) taken straight from Rachel Bertsche's book "MWF Seeking BFF" (which I've obviously already read). I also was a little disturbed by Nelson's perspective of faith. She claims to be a Christian (and was a pastor in the past), but there is a lot of I have to say, I was really looking forward to this book, and I was a little disappointed with it. The first half had some good information in it, but it seemed like everything was either 1.) Available on the blog, which means I've already read it, or 2.) taken straight from Rachel Bertsche's book "MWF Seeking BFF" (which I've obviously already read). I very much enjoyed this book. Having said that, I must insert a disclaimer here that I don't agree with EVERYTHING in this book, and I'm quite certain I don't agree with all the author's life choices or beliefs. While she professes christianity of some sort, she appears to be a religious pluralist and I am not. I could write a couple paragraphs detailing this disclaimer, but overall I really did get a lot out of the book so I'll leave it to the discerning reader to read carefully on her own if s I very much enjoyed this book. Having said that, I must insert a disclaimer here that I don't agree with EVERYTHING in this book, and I'm quite certain I don't agree with all the author's life choices or beliefs. While she professes christianity of some sort, she appears to be a religious pluralist and I am not. I could write a couple paragraphs detailing this disclaimer, but overall I really did get a lot out of the book so I'll leave it to the discerning reader to read carefully on her own if she so chooses. If you can sort the wheat from the chaff, however, there is lots of very interesting information in this book. My main takeaway was that wherever people fall in your circles of friends, *that's okay*. We need people in all different circles or levels and it's okay if you don't "click" with everyone or have a consistent and vulnerable relationship with every person that you like. As an analytical person, I especially enjoyed evaluating my friendships, placing my friends in their respective circles, and observing where my circles are strong and where they are lacking. This exercise also helped me to identify some of my own strengths and weaknesses in my friendships and challenged me to be a better and more intentional friend. I also think this book will appeal to people differently based on their perceived need. One of my friends who read this book with me felt like the author was pushing people to make more friends as she frequently suggested ways a person COULD meet new people and make more friends. I didn't sense the author was saying people *must* have lots of friends, but just that she was offering suggestions for people who feel that need. This book is well thought out and very informative. I have tagged various places through out the book for quick reference. I also really appreciate all of the research the author put in to the book, and like that I have additional books to gravitate towards for further reading. I loved this book!! It took a while to read because it was so full of stuff I really needed to hear. My life and friendships will be all the better thanks to this!! Here is a summary of what the book is about. This essential go- to guide reveals how women can enhance their lives by creating valuable friendships in today's busy mobile world, from nationally recognized friendship expert and CEO of GirlFriendCircles.com. Every woman is searching for a happier, healthier, more fulfilling life. Many realize the significant role that an intimate, tightly knit circle of friends plays in creating a more fulfilling life, but with hectic schedules,frequent moves, and Here is a summary of what the book is about. This essential go- to guide reveals how women can enhance their lives by creating valuable friendships in today's busy mobile world, from nationally recognized friendship expert and CEO of GirlFriendCircles.com. Every woman is searching for a happier, healthier, more fulfilling life. Many realize the significant role that an intimate, tightly knit circle of friends plays in creating a more fulfilling life, but with hectic schedules,frequent moves, and life changes, it's more important than ever for women to establish natural, meaningful friendships that will contribute to their overall wellbeing. In Friendships Don't Just Happen!, Shasta Nelson, friendship expert and CEO of GirlFriendCircles.com, reveals the most important proven steps, processes, and sercrets vital to establishing the five different levels of friendships, or Circles of Connectedness, that women- no matter their age or relationship status- are longing for in today's stressful and mobile culture. This revolutionary, engaging guide will also benefit women who already feel rooted to fabulous friends, with insightful principles that will help them maintain and enhance their current friendships. I have belonged to the website www.GirlFriendCircles.com for a long time. It is a great site. I have mixed feelings about this book, and to be honest, I didn't see it all the way through. On one hand, it has a very good message: as women, we need connection. We need the joy of female friendships and we need the validation of our thoughts and feeling as we push forward in what is still a very male world. What I also loved were the very practical aspects of Friendships Don't Just Happen! Nelson sets out a formula, gives structure to something that we all seem to think will happen naturally I have mixed feelings about this book, and to be honest, I didn't see it all the way through. On one hand, it has a very good message: as women, we need connection. We need the joy of female friendships and we need the validation of our thoughts and feeling as we push forward in what is still a very male world. What I also loved were the very practical aspects of Friendships Don't Just Happen! Nelson sets out a formula, gives structure to something that we all seem to think will happen naturally. Often it does, but most people will not find their social needs met by just leaving chance to lead. Creating friendships in a fractured world needs purposefulness, and that's what this book sets out. Now, why I stopped reading: although Nelson acknowledges introversion, and I think that she sincerely tries to cater to introverts, she most definitely is an extrovert and even her voice felt overwhelming to me. I'm extremely introverted and I felt so pressured to reach out more than I would ever be able to handle. Weekly meetings with potential friends - they're lucky if they get a weekly text from me! In the end this book gave me too much stress to keep reading. 1. We desperately want to have others care about us. 2. We often stay in touch more consistently with acquaintances then we do with the women we consider our real friends. 3. Identifying the different types of friends will also clarify our understanding of what we can expect from them and how we might best move certain people into preferred categories. 4. Evaluate your friendships on the basis of the connection you actually have, not the one you hope to have. 5. No matter how many people we know, most of us long to have a couple of friends that are really there for us. Frientimacy invites us into real-ness. 6. Friendships only progress with consistency. 7. Levels of frientimacy: curiosity, exploration, familiarity, vulnerability, and frientimacy. 9. Friendship = consistency + mutuality + sharing + positive emotions. Friendship is about two people reading each other‘s emotional energy levels and helping foster positive feelings. People and friendships of varying degrees drive me. I need to share, laugh, and discuss with other women. Without friendships I would wither up and slowly die. Shasta Nelson has friends. She has shown herself friendly and has passed on what she has learned to the rest of us in this book. Using a picture of friendship circles, the book navigates us through the varying levels of friendship connectedness and intimacy. The key to feeling ful People and friendships of varying degrees drive me. I need to share, laugh, and discuss with other women. Without friendships I would wither up and slowly die. The key to feeling fulfilled in our friendships is to have a balance of friends in each level of connectedness circles. With unbalance in these defining levels we are quick to feel lonely. Upon evaluation of our own unique friendship circles, the author calls us to action to do the work involved in making friends and keeping friends for a life time. The subject matter was very interesting and it did inspire me to get out there and make new friends, but I also felt it was written in a way that didn't flow very well. There were lots of headings and subheadings and what seemed like sub subheadings that made me forget what the original point was. That said, I found it helpful. Super useful guide to finding and making friends!! For me the 5 circles of friendship framework helped me think about my relationships. It helped me identify why I was feeling disconnected, gave me a better appreciation for the different types of friendships that I experience, and a better approach for expanding and enriching my friendship circles. While reading the book, I did not think it was necessary to draw a distinction between female and male friends, I found the advice and framework worked equally well when I thought about my friendships For me the 5 circles of friendship framework helped me think about my relationships. It helped me identify why I was feeling disconnected, gave me a better appreciation for the different types of friendships that I experience, and a better approach for expanding and enriching my friendship circles. While reading the book, I did not think it was necessary to draw a distinction between female and male friends, I found the advice and framework worked equally well when I thought about my friendships with people of any gender. great, read this in the midst of some really rough friendship issues, with a mentor! This book helped me focus on creating non-toxic positive strong friendships. I would definitely say I grew as a person through opening up and taking some of the advice of Nelson. Not only is it great advice but also a fun read, Shasta has a way of writing that is comical, comforting and wise all at the same time. I highly recommend this to women of any age, and men as well who may be seeking more friends in their lives. There was not a wasted page. All useful information, practical examples, and a framework (five circles) that makes it easy to remember and understand the differences between the friendships we have in our lives. Shasta Nelson has lots of great insight and suggestions regarding your growth and relationships with women in this book. It’s insightful and extremely helpful to see how you are lacking in your different types of friends. At first I thought the title seemed a little cheesy, but I’m so glad that I read this book! I enjoyed reading this book. Even though most of Nelson’s insights are nothing I’ve never heard before, it’s nice to have it applied to friendship, a subject in which I feel there isn’t a lot of expertise. Lots of categories and checklists. Not very thoughtful overall. The idea that making and keeping friends is an active pursuit, not something that just happens, is probably the most valuable (only?) insight this book has to offer. This was a very good read. I wanted to figure out how to make more friends and the little equation helped me understand what and how to have good friends. Good friends equal= time, mutually wanting to spend time with each other, sharing good and positive stories/vibes, and consistent. Very interesting and practical book on building and maintaining healthy friendships. The author shares a wealth of experience and scenarios in addition to research and skill building models. Definitely consider this a valuable resource. This book was just what I needed. I recently moved to a new city and was missing having a circle of girlfriends. 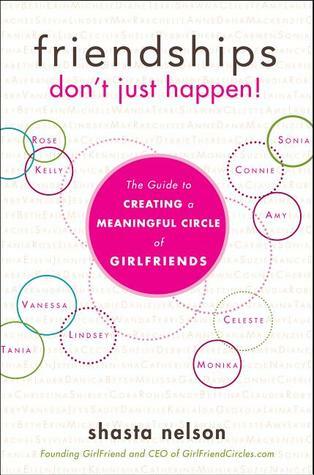 This book gave me actionable advice to start building a circle and it has paid off quickly. Every woman should read this, no matter her stage of life. This book was encouraging, analytical, and practical. I may upgrade to five stars if the advice proves successful. I found the first two thirds or so more helpful than the final section. Love this book. I did not think I benefited from it right after I read it. Later on as my friendships blossomed, though, I realized how helpful it was as a tool when facing challenges. I highly recommend this to all women! The only reason I gave it a 4 instead of a 5 was that some parts were repetitive. This book had a lot of good information and research. Maybe just a touch heavy on quantifying "where" people are in life, but it's a good starter kit. I suspect this is very basic for the socially ept, but I found lots of actionable content.